Rating: 7.4/10. From 152 votes. The P320 from the left. The author’s P320 from the right. 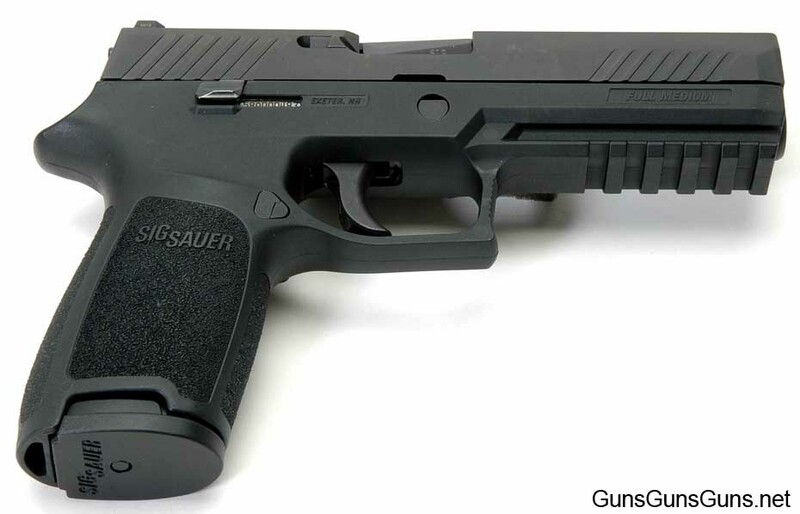 The SIG Sauer P320 is a striker-fired polymer and steel pistol designed provide a hand-fitting, one-gun-fits-(almost)-all self-defense and duty sidearm, with minimal and simple controls. SIG hopes the package will interest agencies that see value in procuring only one gun for most of their personnel. At press time, SIG offers two versions: the full-size, nitron P320, and the nitron P320 Carry model. Both are chambered in 9mm, .40 SW or .357 SIG, with a .45 ACP version forecasted for later this year. I obtained a full-size, 9mm P320 from SIG, and my review follows. The P320 consists of slide, frame assembly and grip modules. It’s heart resides in the frame assembly, which houses the operating system and is, technically, the firearm. As such, it’s serial-numbered; the number is visible through a slot in the side of the grip module. The author’s P320 with the frame chassis partially removed. The slide at first appears to feature the familiar SIG Sauer shape with rectangular rounded corners and seven front and rear diagonal grasping grooves, but there’s a change. In addition to the foregoing, the slide sides now include two flats, with the upper one tapering inward toward the slide’s rounded top. This tapering is also angled, and it starts out wide at the muzzle but then diagonally decreases in width until it terminates at the slide’s rear. I think this design will aid drawing and re-holstering because the slight inward taper reduces metal-to-holster contact. 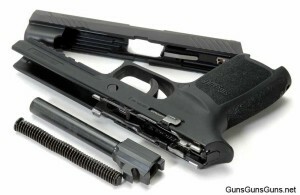 Portions of the slide’s interior are ribbed, and the forward tip of the cartridge pick-up rail is rounded, which decreases the chance an otherwise sharp-edged rail could strike the primer of a live round when clearing it. This inadvertent strike is most possible when clearing a misfed live round. SIGLite night sights come standard and are dovetailed into the slide. You can make horizontal sight corrections by moving either sight in its dovetail slot. To make vertical corrections, you change out either sight with one of a differing height. SIG offers six front and three rear sights. They are numbered and increase numerically in height, starting with “1.” The increase in number corresponds to an increase in sight height. The striker, part of the striker assembly, is partially tensioned when you cycle the slide. Any repair or change to this unitized part means replacing the entire striker assembly. The barrel locks up in the wide ejection port, and a stubby, spring-powered ejector is located at the port’s right center. A dual recoil spring on a full-length polymer guide rod is held captive by end caps. Yet another nice touch: The front retention cap is rectangular with its short sides slightly rounded, while the rear end cap is fully-round. This combination makes correctly installing it much less error-prone. Also, the lower-inner area of the slide’s front is notched to minimize the amount of tilting and compression needed to remove or install the spring assembly. SIGLite night sights are dovetailed into the P320’s slide. The slide moves on four short rails, with two forward and two rearward. The rails are part of the frame assembly. The assembly is held in the grip module by the left-side-mounted take-down lever, which you must remove to free the frame assembly from the grip module. (I had to do some fiddling with it to remove it.) After you’ve removed the take-down lever, push the frame assembly slightly forward and lift to free it from the grip module. The slide stop is ambidextrous and located on the frame’s rear. The magazine catch, located at the trigger guard’s bottom rear, is reversible. To do so, you need a straightened paper clip. Paraphrasing the owner’s manual, insert the clip into the catch’s side (which captures the magazine catch stop), then remove and reverse the catch. The metal-body magazine includes a removable polymer base plate and polymer follower; two magazines come with the gun. The base plate is slightly enlarged on its sides. The magazine body features three witness holes in its right side, and in my 9mm sample gun they’re numbered 5, 10 and 17. For .357 SIG and .40 SW, the magazine holds 14 rounds for use in either the full-size or P320 Carry pistols. The grip module features fine pebbling on frontstrap, backstrap and sides. The grip includes a lanyard loop hole at the bottom rear. The module is dished out on both sides behind the trigger. The area above the magazine base pad is relieved to help you remove a stuck magazine. The well-shaped frame has a nice, high grip-tang for high hand placement. The large trigger guard is squared and grooved across its face. The dust cover includes a 1913 picatinny rail, on which the SIG Sauer light easily fit. 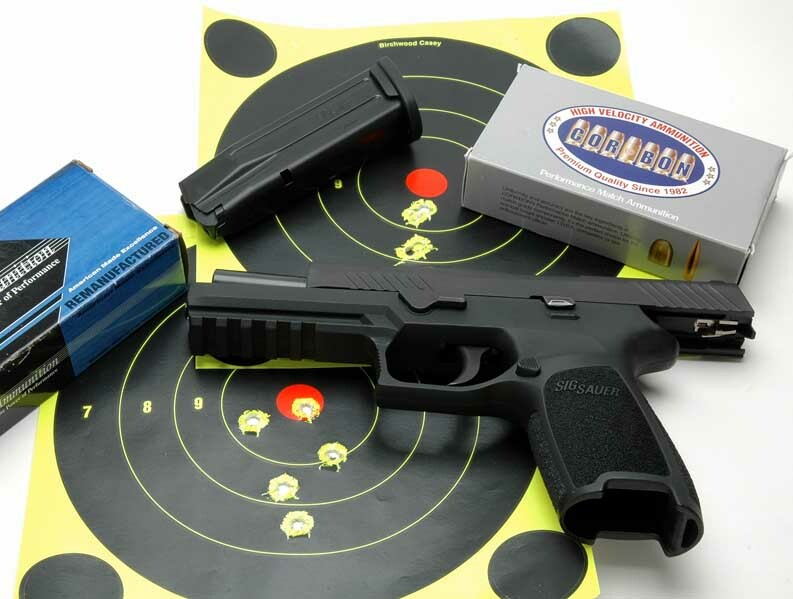 The P320 features a unique five-part safety system, standard on all models. These parts include a striker safety, a disconnect safety and a three-point take-down safety system. The three points? 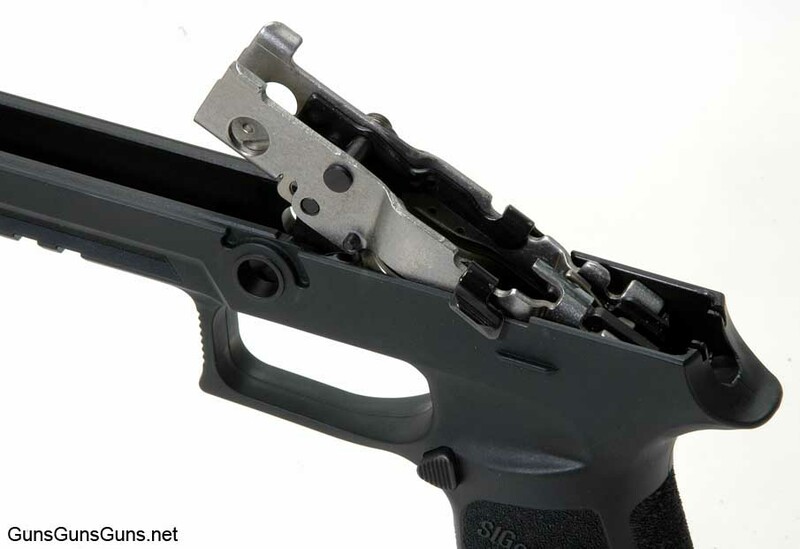 You can’t disassemble the P320 unless you’ve removed the magazine and locked the slide to the rear, and you don’t have to pull the trigger to release the striker. You don’t need any tools for any of this, either. The front and rear straps and side panels are finely pebbled. The backstrap includes a lanyard hole. SIG offers three grip modules—standard, compact and subcompact—for this pistol, and the frames are identical to the SIG P250 frames. The barrels are too, making them interchangeable between the two models. A threaded barrel is optional. 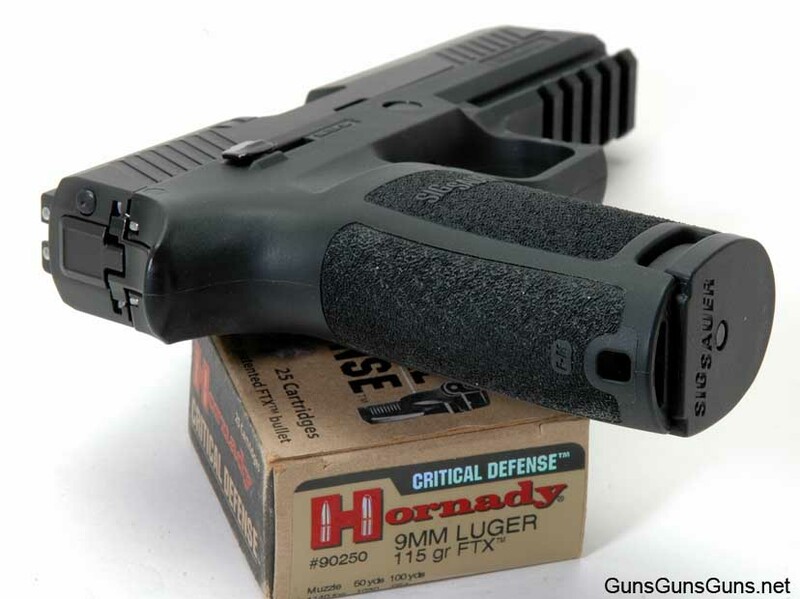 I’ll list prices for grip modules and barrels at the end of this review, and you can also find them under “Accessories for the P250” on SIG’s Web site. On my sample P320, the frame is marked “FULL MEDIUM” on the dust cover’s right side. The grip modules vary in circumference based on SIG’s survey of 40,000 hands (done for the P250), the results of which lead the company to believe the three frames will fit 80%–90% of hand sizes. The trigger pull on my sample P320 was good and let off at 8.5 lbs., with a quick reset. One of my associates said the trigger felt “spongy,” but when it breaks it doesn’t move (meaning there’s little trigger overtravel). I think for a striker-fired pistol, it’s close to or right at the top of factory-supplied trigger pulls. The groups might have been tighter if I’d blackened the rear sight because the white in the rear sight tends to draw my focus to it and away from the front sight, but I wanted results from the gun as it ships. I noticed, as I had when I shot the P250, that felt recoil was soft. Truth be told, I find that if a SIG pistol doesn’t shoot well, it’s most likely the shooter, not the gun or ammo, causing the problem. 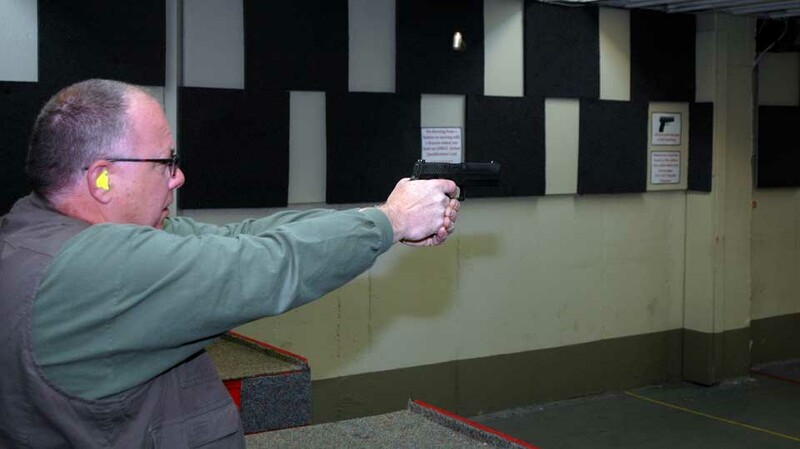 Dr. Mulligan fires the P320. I tried out the supplied polymer paddle holster, which is a strong-side, outside-the-belt rig set up to provide a slight muzzle-to-the-rear carry. The paddle is marked “P250 Full Size” and “P250 Compact.” It provides gun retention via an internal stud that snaps over the trigger guard, and an allen-head tension screw in the holster body. The holster provided casual but not deep concealment for my body shape, but worked well for some of my shooting buddies. To the good, a new P320 owner is ready to go and lacks only ammo. The pistol is easy to handle, offers good balance and points well. Magazine changes were simple and moved smoothly for insertion and removal. The base plate extension, which fit into the frame’s matching cutouts, should make removing a stubborn magazine much less of a chore than it can be. Given the simplicity of operation and disassembly (save for the aforementioned fiddling), the P320 should prove easy to teach shooters to use and maintain because there’s little to remember to do and not do. And as I mentioned, the pistol pointed well for me and my associates. Coincidentally, our hand sizes all differ, but it worked for all of us. 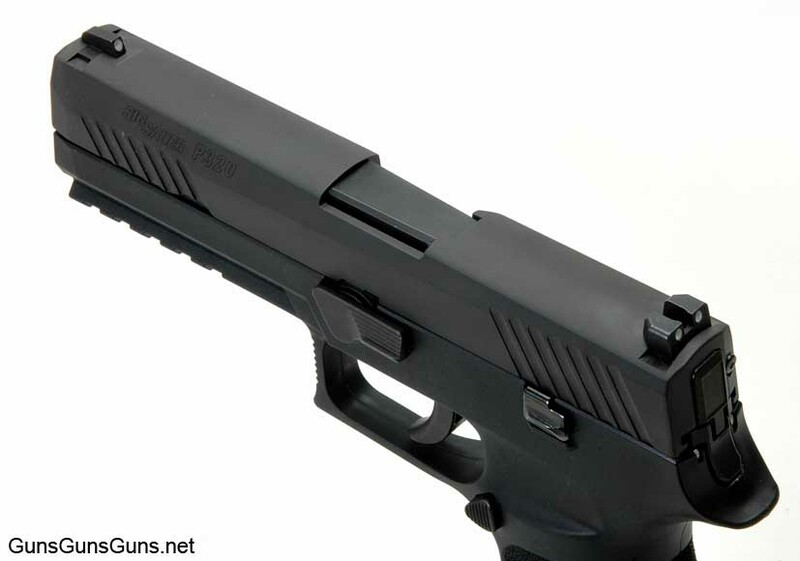 As I noted at the outset, with the P320, SIG has tried to design a one-gun-fits-(almost)-all duty and self-defense sidearm, with minimal and simple controls. These are long-standing goals of many firearms companies, of course. To get there, and do so at a reasonable cost, is another matter entirely. However, I can report the P320 appears to fit these requirements quite well. Bottom line: End users will be well-served with the SIG Sauer P320. This entry was posted in .357 SIG, .40 SW, $501-$750, 9mm, Full size, Semiauto, SIG Sauer and tagged Handgun Reviews on July 15, 2014 by Walt Rauch. I have not fired this gun but it was a purchase i never thought i would make as i had one gun, a German gun, 1911 that also made the sig saucer 1911 which i sold as i just didn’t like it. Anyway, i purchased a used beretta 92fs in perfect, like new condition. Used it one time and just didn’t feel right with it. I returned it today and they would take it back against the purchase of another gun. I looked at so many but this Sig 320 just felt perfect. I liked its heft (weight), the simplicity of the design and the fact it would be my first non all steel gun. I am anxious to try it out, but i am very pleased with the look and feel of it and i think that is very important. Let you know how it works out. Had my P320 out at the range last week and I think I’m in love….. I had a p250 compact, the p320 is not the same thing. It is far superior. The trigger is completely different. I have sub compacts to 1911s My p320 will out shoot most of them and is the best 9mm I have shot. The Sig P320 looks, feels and IS a quality firearm. It is one of those guns that as soon as you pick it up, you know that you have a superbly designed handgun of outstanding quality. If you compare it with the S&W M&P, you will know what I mean. I only wish that I could shoot as well as the gun can shoot. My P320 carry 40S&W shoots like a dream. Accuracy and little recoil are evident. Super easy to disassemble and clean. Priced at under $600 with night sights it’s a bargain. I just may get another one! A Sig P320 compact in .40S&W was the very first pistol I ever purchased. I chose it based on it’s look, feel and simplicity, as well as the option to fit the grip module to my hand which is quite large. Sig’s reputation was also a factor. It came with a medium size grip but I bought the large Carry grip which fit my hand like a glove. The Carry grip handle is a bit longer than the Compact model which made the fit perfect for my hand, and allows the use of the full size magazine as well. For a first time shooter I was very impressed at the groups I was shooting and as I refined my shooting technique, the groups just kept getting smaller. Recoil on my P320C was much softer than I expected. Not knowing what a great reputation this gun has, I’m very happy that I chose it. I just wish that it had a thumb safety, which I understand is available but only for law enforcement . I really hope it becomes an option for us pawns in the near future…The more I shoot it the more I like it. It’s a great gun and super easy to clean in the field too. 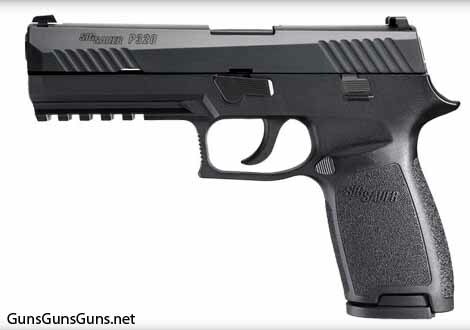 A P320 in .45ACP just may be my next purchase.